This is a tutorial about how to backup DVD to Apple TV with excellent DVD Video Converter. With this practical program, you could play many different videos files on the go. Have you ever tried to watch DVD movies on your Apple TV? It’s so cool to watch a high definition movies on your Apple TV. But It’s a pity, because Apple TV can’t support you to play DVD freely. It only supports H.264 and MPEG-4 videos. So if you want to enjoy the latest DVDs on Apple TV, you just need to convert DVD to Apple TV supported video formats. Here are some information about the guide to finish it. WonderFox DVD Video Converter is a versatile tool which helps you back up DVD, convert video between any format, edit video or even download online videos like YouTube video. Although it has so many functions but is actually very simple to navigate. Moreover, it only costs 19.95USD and is time-limited. Next let’s have a look at how to convert DVD to Apple TV in very simple or quick steps with fast speed and high quality. First of all, you can download a free trial of WonderFox DVD Video Converter and install it on your PC. Open it and hit “Load DVD” button on the main interface. Note: You are allowed to choose which parts you’d like to load including the main movie or all movies. And then click the “Apple” item. Choose “The New Apple TV” or “Apple TV 2”or”Apple TV”. Note: With WonderFox DVD Video Converter you can not only convert DVD to Apple TV but also convert DVD to any other pop portable devices like iPhone, iPad, Samsung GALAXY Series, Nokia Lumia series, PSP, Xbox, BlackBerry cell phones, etc. Click the big blue “Run” button to start the whole conversion process. Now you can watch DVD on Apple TV without any question. Note: Actually before the conversion, you are able to edit the DVD. 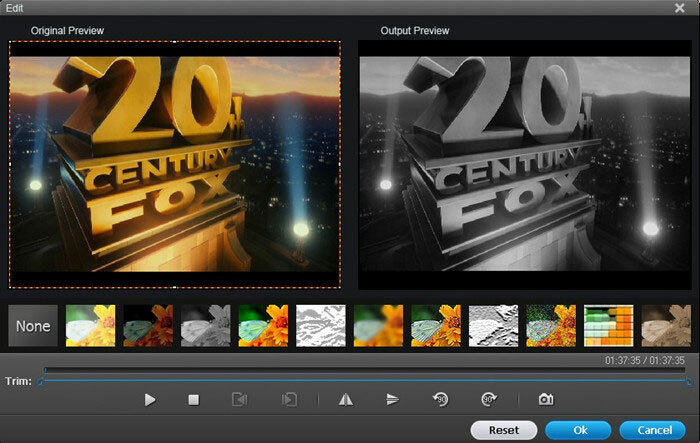 That means this app supports you to add some special effects like Brighten, Blur, Noise, Old Film and more. The image below shows the comparison between original preview and output preview. Now Apple TV may still throw you into an awkward situation in case you want to watch DVD movies on Apple TV with your dearest family since built-in DVD player is not available on this widescreen TV. All you need to do is to rip DVD to Apple TV. Here Wonderfox DVD to Apple TV Converter for can help you rip DVD to Apple TV compatible format like MP4 for free. With a few clicks, you can turn your Apple TV into a real DVD movie library without spending a single cent! While converting DVD to Apple TV, you don’t even have to worry about DVD copyright, because this program enables you to remove all kinds of DVD protection technology, no matter the CSS encrypted DVDs or Sony ARccOS protected DVDs. Extract Audio from DVD File: Extract music from DVD for convenient playback. Transfer DVD to iPad: Play DVD on iPad without format restriction. Convert DVD to HTC: Play DVD on HTC cell phones with ease.